I. Am. King. Of the world! My name is Trice and rraarrrr at you! Rraarrr! Grraarrrr! Some of you wannabe dinosaurs prance around all pretty and orange, but you are nothing compared to my ferocious self! And Cheerios? Come ON! Only wussies from Planet Loserville go after stinky Cheerios. As if demanding all the Cheerios in the world will make you strong and powerful and fearsome! AS IF! … Werther’s Originals. Rraarrr! Give. me. your. candies! All the Werther’s will be mine! Mwahahahaha! Rraarrr! 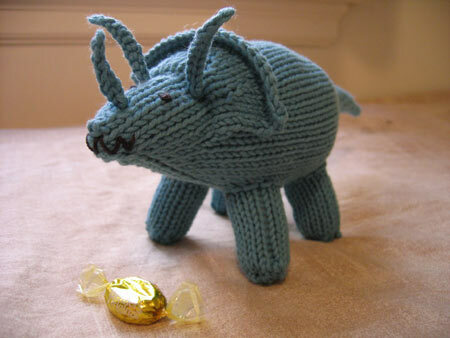 Pattern: Dinosaurs by Jennifer Thurston of Xtreme Knitting. This is Trice. The other two were rejected because, come on, no frill! Yarn and needles: Classic Elite Four Seasons, less than 1 skein, knit on Bryspun straights, US 5. I really enjoyed working with this yarn, and love the way it knits up. I think it would be even more fun on 7s ;). Finished size: Ha-uuge! Equipped with some Werther’s, Trice will rule the world (13″ long, 4.5″ high). Mods: I didn’t change a thing except to crochet the horns. For real! And you know (you know!) I don’t crochet just for anyone 😉 – this dino is for Purly! Also, I realized that I was misunderstanding some of the instructions, so dinosaur #1, Mr. Stegs, has some unintentional mods 😉 (it has to do with “purl rows” versus “wrong-side rows”). Of course Trice has a vicious 5-tooth growl. Of course! How else could he demand all the Werther’s and become King of the World?!? Rraarrrr! Dang, you got really excited about that vicious knitted trice. Love him, and after I knit some nautiloids, I’ll be trying knitted dinosaurs. I don’t think mine will be so ferocious, though. Glad to hear a good review of the yarn as I have a bag of it waiting to be knit up! You and your dinosaur commentary are hilarious! Damn, if that’s what Werther’s say maybe I should be more careful about who’s around when I eat them… 😉 Trice is awesome!! 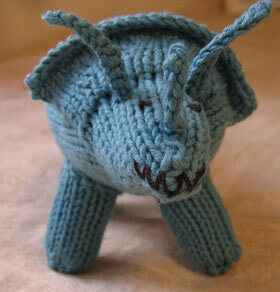 it starts innocently enough with crocheted horns…. he is very ferocious and cool looking. Lucky Purly. He’s adorable (although don’t tell him I said so – tell him I said ugly and mean looking). He has good taste in candy too. I find it hilarious that embroidered fangs still look like a big dino grin, every time. Very nice! Rrarrrr!!!! He is home terrorizing the cats. Cause he is ferocious enough to eat them, no matter what their size! Rrraarrrr! Rrrarrrrr! He’s very cute, um, I mean, ferocious! Roar!! Get those Werther’s. Tear off that wrapping and dig into that sweet candy! Very cute dino! How can it be so cute and so scary at the same time! I quail before thee, small fuzzy thing. No one could deserve this more than Purly. Yay! AaaAAAAAaaAAAAAH! Please, take all my Werther’s! We will sacrifice our hard candies [non of those woosie chewy ones] to spare our blog from being distroyed by your fearsome teeth! AAAaaaaAAAAaaaAAAAaauuuuugggghh!!! GRRRRR! “Scary” yet cute at the same time — a perfect combination in my book. grumperina, you should really think before you unleash dinosaurs onto a 21st-century planet. did you not see jurassic park? hehehe You are a gas! Love your dino but your descriptions are the best. Werthers? Man, even the herbivores are going to make fun of him behind his back. We know that in his heart, he’s a softie. It sounds like you need to escape for a while and get away from knitting. When does summer start for you? You’re such a fast knitter. I am jealous. Hilarious. Rrrarrr! I can’t wait to meet Trice at Purly’s place this week. I will bring sacrificial candy. he’s so cute/vicious. a perfect combo! Just the smile I needed after a too long Monday! RRRRaaaarrrr! I love your dinosaurs! 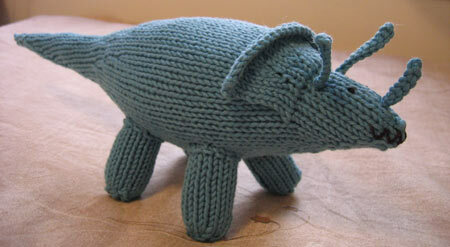 I am working on a knitted toy as well and I must say that they are great knitting projects. Loves him. Glad to know that my Cheerios are now safe too. Of course, now I’ll have to be more careful about my Werthers….. These little guys are addictive. There are now various kidlets in my near vicinity who are the proud companions of 1 Bronty, 2 Trice and 3 Mr Stegs (or Emily the Brontosaurus, Serah and Tricky the Triceratops, and Enzo, and 2 unnammed stegosauri). Definitely a ferocious killer. I can see that with just a few mods, this pattern could also produce a good beetle or three. Very cute! I love him too!!! Nothing like a little dino to take the edge off a foreign language pattern or an eleventy million stitch round! I surrender… here are my Werthers and all my Rogers Cremes. It immediately put to mind being six years old and terrorizing the babysitter. Wonderful! Very cute! Loved his dialogue. Awww! I mean, Aggghhh! Run away! All your Werthers are belong to him. My husband just loves it when I read these cute little dino posts to him. He’s not feeling well and this one just made him laugh! He’d better take good care of his 5 precious pearly whites if he’s going to be snacking on Werther’s for all eternity. How about some spinach now and then? oh – i am in love. in love i tell you. trice-y darling i must have you. all of my werthers are yours….